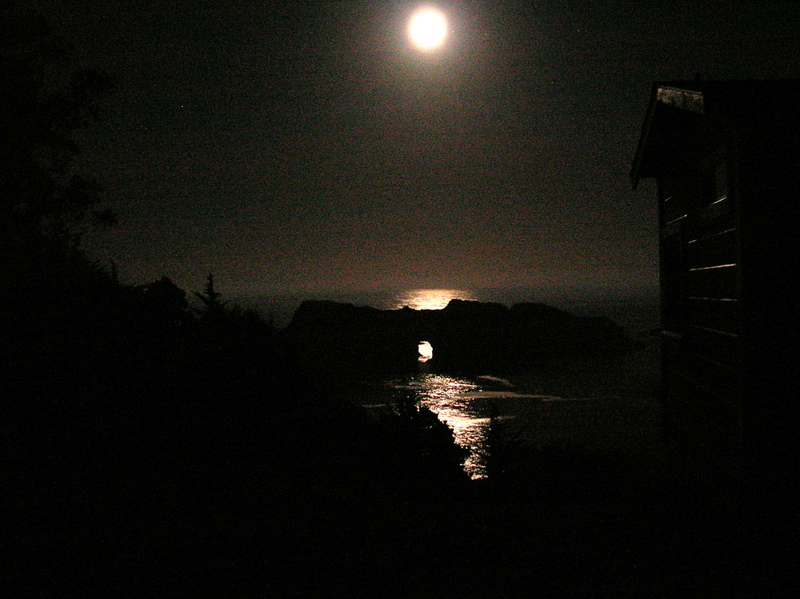 One night I was sleeping in my cabin by the Pacific Ocean in one of my favorite places on Earth. It’s the kind of place where every day you wake up, look around, and say, “this is very good.” But one night I woke up for no apparent reason around 3:00 in the morning. It was as if the cosmos had whispered, “psst! psst!” I struggled to clear my head, looked out my window and said, “God.” I scrambled to find my little Nikon Coolpix, went out onto the deck, set the camera on the rail to steady it, opened the shutter and tried not to shudder. I knew I was asking the camera to do something impossible. I said a little prayer. This image was the answer. The full moon reflecting on the ocean shining through a cave running through an offshore rock. My camera said, “Cool pic.” I said, “God, this is very good.” I sat and gazed at this wonder in time and I felt a bit beyond time. I felt connected to all things. I loved all things and all things loved me back. I first celebrated Earth Day on the first day of spring during my junior year in high school and have done most years since. A month ago some friends were sending around a video. I saved it to share in this Earth Day meditation. If the link doesn’t work, look on Vimeo for “The Most Astounding Fact” by Max Schlickenmeyer. Astrophysicist Dr. Neil DeGrasse Tyson was asked in an interview with TIME magazine, “What is the most astounding fact you can share with us about the Universe?” This video beautifully expresses his answer. Every person on Earth is made up of atoms that came from exploding stars that came from star nurseries that came from what scientists call The Big Bang. We’re all connected, each one, one with the first one. From a Biblical perspective every adam came from the first adam, crafted on a wheel, spun into creation by the Master Potter as he/she began to create. Take a little H2O, blend it with stardust, breathe into it the breath of life. psst. This is very good. The cover of the April 20, 2012, issue of the Austin Chronicle offers up one of those iconic Apollo mission photographs of the Earth rising over the horizon of the Moon, a body also made up of the same stuff as you and me. The headline reads: “Earth: Fun While It Lasted.” The article poses a good question: can the Earth be saved? I believe the answer is yes, of course. This marvelous planet is not going anywhere anytime soon. In fact, she’s been through cycles of life, destruction, and re-birth many times before. We can’t know with certainty what the near future holds; but if scientists’ projections are even close to the mark, sooner or later the earth is going to slough off this toxic environment we are destroying. Contrary to popular lore, I’m not even sure the roaches will make it. But then the Earth, self-healer that she is, will transform into a new Earth, adams and atoms mixing together to form whatever the Potter dreams up next. In the meantime, at least as long as I am sentient in time, I plan to give thanks every day for this beautiful blue planet. And while I can’t just totally stop being part of the problems that are degrading the ecosystem of present-day Earth, I can do what I can to be part of the solution, part of the healing process. psst. I hope the rest of my species will wake up and do the same. david gilliam, earth pastor, faith united methodist church, austin. for more about faith church, click here.